Want to honor that trusty Christmas tree by making sure it has a landfill-free legacy? Here are some composting options in the Bay Area. Most services will only accept trees free of decorations, stands and artificial snow. (Trees with artificial snow are known as flocked trees.) Even if flocked trees are accepted, they can not be composted and will be trashed. If you don't see your town listed, contact your local green waste or waste management company. There is no charge for tree collection for town residents. On regular service days from Dec. 26 through the end of the third week in January, residents should leave their trees on the curb. Collection will be done using a special truck that may service your block much earlier or later than the regular trucks. Remove all lights, decorations, tinsel and the tree stand before placing your tree next to your carts. Trees over six-feet tall should be cut in half. Do not place the tree in any type of plastic wrap or bag. Small trees may be placed inside your organic cart if you prefer; just be sure to cut it into small pieces that won’t get stuck in the cart, and close the lid fully. Fake and flocked trees cannot be collected and composted through this free program. Boy Scout Troop 11 is also hosting its own annual Christmas tree pick-up. Trees are collected throughout the month of January every year. Set your unflocked trees at the curb with your regular trash pick-up. Trees over six feet must be cut to six feet or smaller. Remove nails, tinsel, ornaments and tree stands. 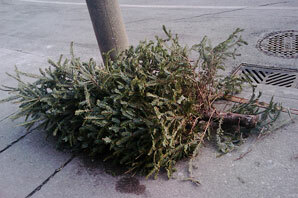 You can place your holiday tree at the curb on your normal collection day through the month of January. Trees must be cut to a maximum of four-feet tall. You may also choose to drop off your holiday tree at the Berkeley Transfer Station at no charge during the month of January. Businesses and residents of multi-family buildings who don’t normally have plant debris service can call 311 (or (510) 981-7270) to schedule the service. After January, you can still cut up your tree to fit in your plant debris cart, or bring it to the transfer station for the minimum compost fee of $23. Remove all lights, decorations, tinsel, bags and tree stands. Flocked trees will be collected, but they are not compostable. For a $5.00 donation per tree, local Boy Scouts will pick up holiday trees from Dublin residents on Saturday, Jan. 7 as part of their annual fundraiser. Reservations are required and will be taken until 3 p.m. on Jan. 6. Send your email request to xmastreepickup@dublintroop905.org or call (925) 967-2141. Only clean trees will be accepted. No flocking or tinsel allowed. Remove the tree base or stand. You may also place your tree at the curb by 5:30 a.m. on your regular service day through Dec. 30. A truck exclusively for recycling holiday trees will collect the trees. Only clean trees will be taken (no flocking or tinsel). Cut trees down to four feet or less. Remove bases or stand. Or your tree can go into your organics cart along with acceptable yard trimmings anytime after the holiday. Your cart will be emptied on your regular service day. Only clean trees are accepted (no flocking or tinsel). Tree branches and stumps must be cut into lengths that will allow the lid to securely close. Non-recyclable flocked trees or trees with tinsel can be picked up by Amador Valley Industries. Call (925) 479-9545 to arrange for disposal of your flocked or tinseled tree. An additional fee may apply, unless you use one of the three large item collections available to residents per year at no cost. Republic Services will service holiday trees curbside at no charge for single-family residents that have weekly green cart service from Jan. 2 to Jan. 12. Multi-family residents should contact their property management for disposal options. The Boy Scouts will also collect Christmas trees on Jan. 6. There is a $5 fee for compostable trees and $10 fee for non-compostable trees. All pick-up orders must be made by Dec. 28. To schedule a Boy Scout pick-up, fill out the coupon here and mail it to BSA Holiday Trees at the address provided. Flocked trees cannot be recycled and must be put inside your garbage container. For free pick-up at one- to four-unit residences: Until Jan. 13, place your clean, green holiday tree at the curb, next to your green yard trimmings cart on your regularly scheduled yard trimmings collection day. Remove all tinsel, ornaments, nails and tree stands (metal or wood). Place trees curbside by 6 a.m. on collection day and no earlier than one day before. Trees must be no more than four-feet tall. Cut taller trees in half. 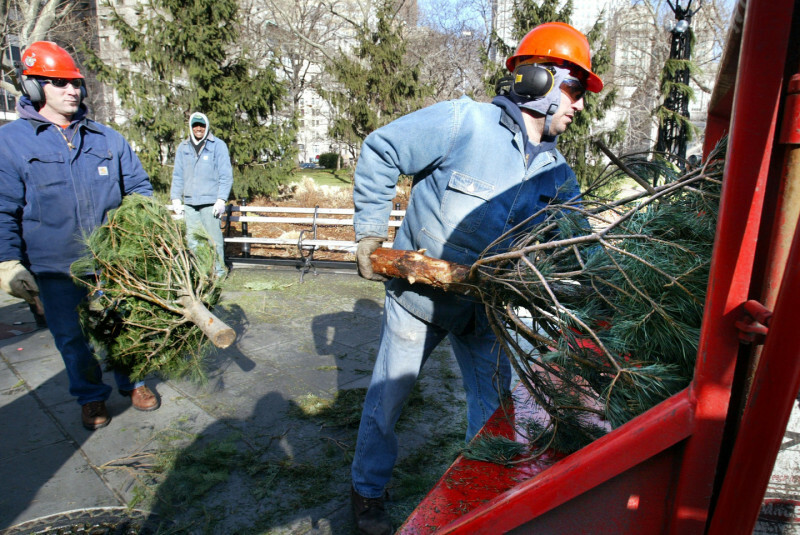 For five-unit residences or larger: Tenants may take clean, green holiday trees to the Davis Street Transfer Station for recycling at no charge. There is a limit of one tree per household. Property owners/managers may call Waste Management of Alameda County (510-613-8700) to schedule free pick-up. After the first two weeks of January, recycle your clean, green holiday tree in your green yard trimmings cart at any time. The car lid must close. Or take clean, green holiday trees to the Davis Street Transfer Station for recycling at no charge. During the first two weeks of January, place your once-live tree curbside on your scheduled collection day. Remove all lights, decorations, tinsel and the stand before placing your tree next to your carts. Trees over six-feet tall should be cut in half. Do not place the tree in any type of plastic wrap or bag. Tree collection will be done using a special truck that may service your block earlier or later than the regular trucks. Small trees may be placed inside your organics cart if you prefer. Cut it into small pieces that won’t get stuck in the cart, and make sure the lid will fully close. Fake and flocked trees cannot be collected and composted through this free program. Please contact waste service to arrange for a special collection. Tri-CED will be collecting trees until the end of January. On your regular collection day, simply set your undecorated green tree at the curb or place inside the green yard waste cart. Trees will be hauled to the compost facility. Flocked trees will be accepted but not composted. Remove tree stands, metal or wood. If it fits, place the tree inside the green yard waste cart for collection on your service day. If your tree does not fit inside your yard waste cart, cut it in half, and place half inside the yard waste container and the other half in the gutter next to your cart. You can also drop off trees at Tri-CED Recycling Center, Monday through Saturday 9 a.m. to 4:30 p.m.
Place your Christmas tree at the curb on your yard waste day for free pick-up. If your tree is five feet or longer, cut it into lengths of no longer than three feet. Trucks cannot pick up anything longer than three feet in length. You can also take your tree to the Recycling Center and Transfer Station (RCTS) located at 1300 Loveridge Rd. in Pittsburg. RCTS is open daily, except New Year's Day, from 7 a.m. to 6 p.m.. Christmas trees will be taken at no charge with a limit of one tree per vehicle. Remove all trim, ornaments, lights, tinsel and the tree stand. Curbside collection is available from Marin Sanitary Service Jan. 2 through Jan. 12, from Mill Valley Refuse starting the week after Christmas, from Novato Disposal Jan. 2 to Jan. 6, from Redwood Empire Disposal and Bay Cities Refuse on regular yard waste days, and from Tamalpais CSD from Jan. 8 to Jan. 12. There are also drop-off locations throughout the county. 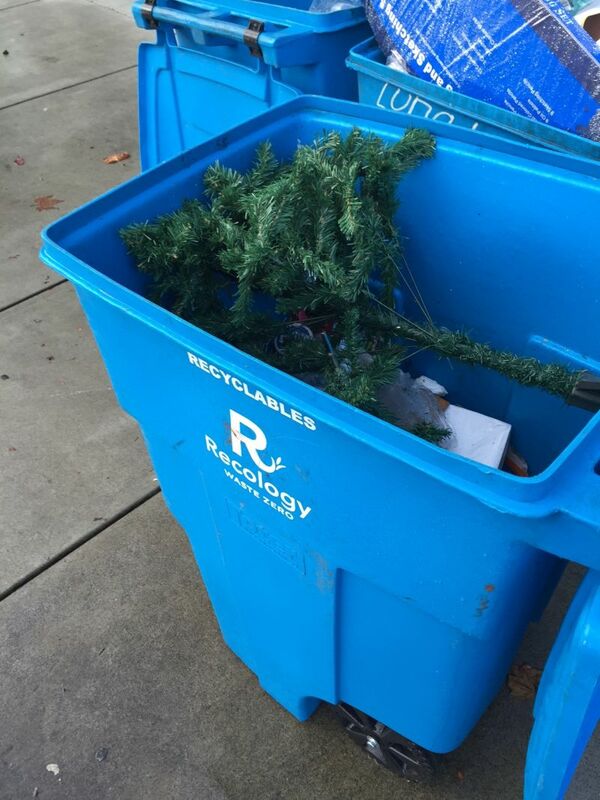 Zero Waste Marin has a comprehensive list of the town's various Christmas tree recycling options and requirements. The annual Napa Valley Boy Scouts' Christmas tree pickup will comes to Napa on Jan. 6th. Have your tree on the curb by 9 a.m. on Saturday morning. Do not set out your tree earlier in the week. Remove ornaments, nails, tinsel, stands and metal spikes. A voluntary donation of $10 per tree is suggested and appreciated. Do not leave money on the tree; Boy Scouts will come to your door. Leave a check made out to “Boy Scouts of America” in an envelope at your door. Customers in Napa County who miss the January Boy Scout tree pick-up may place their tree out for collection on their normal service day beginning the following Monday. Follow the above guidelines and cut trees over eight feet in half. Flocked trees are accepted, but will not be recycled. Wreaths, pumpkins and other holiday greenery can go in the compost cart. You can also recycle your old Christmas lights at the Napa office in December and January. Place clean, unflocked trees next to your bins on your regular service day between Jan. 2 and Jan. 12. Be sure to remove all tinsel, decorations, plastic bags, stands and lights. If your tree measures more than six feet, please cut it in half before putting it on the curb. Please note that a separate Recology truck will pick up trees and may not pick up your Christmas trees at the same time as the compost bin. Please contact Recology if your tree is not picked up by the end of the day on your regular service day. You can dispose of trees after Jan. 12 at a transfer station. Place trees curbside on normal yard waste pick-up days during the month of January. All decorations and stands must be removed before they can be collected. (Flocked trees are accepted, but won’t be composted.) Place trees next to your compost cart. Trees over eight feet must be cut down to shorter lengths. After January, trees must be cut down to fit in the compost bin with the lid closed for collection. West Valley Collection and Recycling will pick up trees from single-family residences on the curb during regular service through Jan. 19. Trees must be less than five-feet tall and placed at least one foot from carts. Trees exceeding 5 feet in length, flocked and decorated trees will not be collected. For multi-family buildings, holiday tree dumpsters are available for rent. Owners and/or property managers should contact (408) 283-9250. Trees will be collected from Jan. 8 to Jan. 12. Strip the tree of ornaments and decorations and set it out on your regular collection day. The city does not collect trees on private streets. Residents of multi-family dwellings may set out their trees on the nearest public street. Call (408) 615-3080 to find out what day trucks will be servicing your area. You can also bring in your tree (no larger than nine feet) to the Corp Yard at 1700 Walsh Ave. during the week of Jan. 8. After Jan. 12, you will need to cut your tree and place the pieces in the green cart. Flocked trees should be placed in your garbage cart. Trees must be five feet or smaller. Place them next to your recycling bin or trash throughout January. Remove metal stands, lights, ornaments and tinsel. Flocked trees and wooden stands are accepted, but will be considered trash. Curbside, drop-off and special pick-up services are available for Christmas trees throughout the county. Programs take place during the end of December and early January each year. Often trees must be cut down to five feet or into three-foot sections, depending on the city. Several Boy Scout troops will also be picking up trees. Contact Recology Vacaville Solano for more details. Residents may take up to two trees to drop-off locations at the hyperlink above at no charge. You can also cut the tree to fit into your yard waste container or have your whole tree picked up at the curb in select areas. Put your tree in your yard waste container and place at the curb on your regular yard waste collection day. Cut to fit into your bin. Trees sticking out of the container can interfere with the lifting arm on the truck. Call (707) 565-3333 for an appointment to have a non-profit organization in your area pick-up your tree. There are also special tree collections for Rohnert Park multi-family complexes.